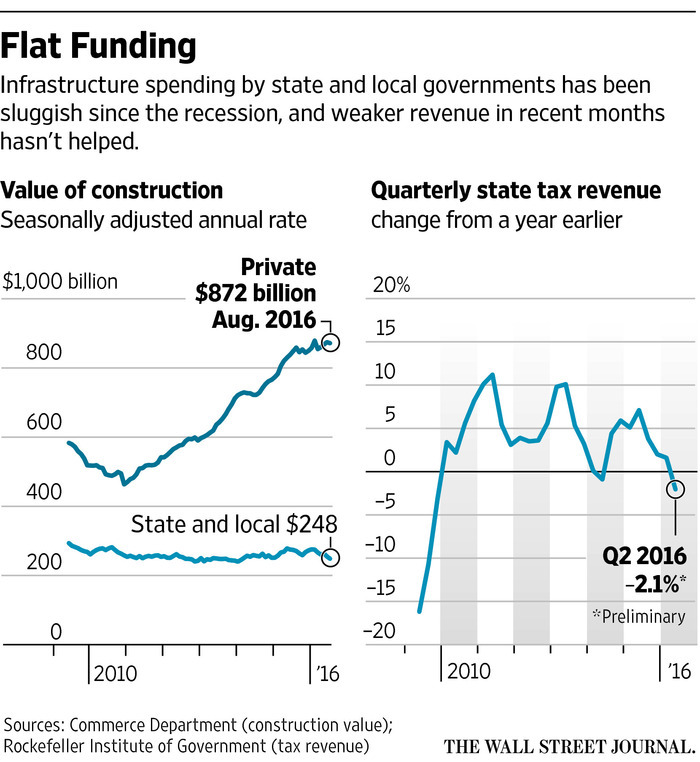 10/26/2016, The Wall Street Journal – A sharp pullback in spending by cities and states on infrastructure—from highways to sewage systems to police stations—is weighing on U.S. economic growth. Such government austerity is unusual in the eighth year of an economic expansion, and it is acting as a headwind just as the worst effects of the energy-industry bust, a strong dollar and inventory drawdown are fading. State and local governments spent an annualized $248.47 billion on construction in August—the least since March 2014 and down nearly 11% from its recent peak in mid-2015. The decline depressed gross domestic product growth this spring and was on track to weigh on growth again in the third quarter. “We’re seeing anemic [government] revenue growth and consistent austerity-oriented budgets,” said Gabe Petek, managing director for state ratings at S&P Global Ratings. States are trimming investments in infrastructure and higher education, “areas of the budget helpful for generating economic growth going forward,” he said. In Kansas, officials this spring delayed 24 road-construction projects to help balance the state budget. The more than $500 million in work had been slated to start between this year and the end of 2018, including expanding U.S. 50 into a four-lane expressway near Dodge City. Instead, the state will spend money to maintain existing roads. “We want to make sure the roadways we currently have are in the best condition as possible,” said Joel Skelley,director of policy at the Kansas Department of Transportation. Total state and local government spending last year accounted for roughly 11% of U.S. economic output, four times as large as federal nondefense spending, and swings in public investment can have outsize effects on the growth rate. The Commerce Department will release its first estimate for third-quarter GDP on Friday. Many state governments have yet to fully recover from the recession and associated steep declines in tax revenue. In late 2015, inflation-adjusted tax revenue was lower in 21 states compared with the peak before or during the recession, according to Pew Charitable Trusts. The situation doesn’t seem to be improving. Preliminary data indicate that state tax revenue fell 2.1% in the second quarter from a year earlier after advancing just 1.6% in the first quarter, according to the Rockefeller Institute of Government. The recent drop reflected mixed stock-market returns and slowing growth in sales-tax collection and paycheck withholding. Revenue declines restrain the ability of state and local governments to borrow money for capital projects. Such a situation prompted Connecticut to cancel or delay selling about $1 billion in bonds earlier this year. By law, the state has a debt limit tied to tax collections, and lawmakers must make cuts when the limit can’t be raised. As a result of the lost funding, the University of Connecticut delayed a $150 million renovation of its Gant Science Complex by several months and postponed plans for a $10 million overhaul of the roof at Gampel Pavilion, home of the national-champion Husky basketball teams. Instead, the university will fix leaks. “We’re trying to balance priorities,” said Scott Jordan, the university’s chief financial officer. The cuts are “forcing us to take a look at what things support our core mission and Connecticut’s economy,” he said. At the same time tax revenue is falling, costs for Medicaid, public-employee health care and pension obligations are rising, leaving many states with little discretion to deploy tax dollars elsewhere. Democrats and Republicans disagree on the appropriate size and role of government, but infrastructure spending often enjoys bipartisan support. President Barack Obama and the GOP-led Congress last year enacted a $305 billion, five-year highway bill. Many Republican governors advocate spending to repair crumbling roads and support basic services, though some favor public-private partnerships for infrastructure. Still, some conservative economists argue the system of tax collection and government funding is inefficient and that long-run economic growth would benefit from lower public outlays. For governments faced with tight funding, putting off building projects can be more politically palatable than sharp cutbacks in public safety or school budgets. Through this year’s first eight months, state and local construction spending was down 1.4% from a year earlier, while federal-government construction outlays were flat and private-sector construction spending was up 7%. The data weren’t adjusted for inflation. The government cutbacks could dent U.S. economic growth overall, many economists say. “It’s going to be a very significant drag in the third quarter,” said Pantheon Macroeconomics chief economist Ian Shepherdson. But he said he expects a rebound in late 2016 or next year because the volatile construction-spending data are undershooting the trend suggested by government revenue numbers. Construction of public buildings—courthouses, fire stations and other government facilities—should begin to rise in 2017, Dodge Data & Analytics predicted in a recent annual outlook. “This is expected to be the bottom of the cycle for public buildings, as government fiscal conditions have slowly mended,” the report said. Troubled finances are weighing on state credit ratings, a report card of fiscal health. S&P downgraded its ratings of six states so far this year—the most since 1991. The downgrades include states where political gridlock has upended the budgeting process, while in others, such as Alaska and North Dakota, a pullback in the energy industry is weighing on tax collections. Despite the downgrades, state debt remains highly rated, including 15 states with the highest AAA rating. Most states are selling bonds to refinance existing debt, not to raise funds for investment in new projects.